More Time to Get your 2019 Restoration off to a Great Start!! 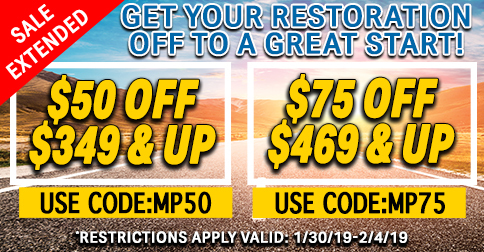 Home>More Time to Get your 2019 Restoration off to a Great Start!! MORE TIME to Get your 2019 Restoration off to a Great Start!! Save $50 on orders over $349 and Save $75 on orders over $469! Ground Up is EXTENDING your chance to save! SAVE $50 on orders over $349 or SAVE MORE with $75 off orders over $469! Use coupon code MP50 and get $50.00 off your orders over $349.00! Use coupon code MP75 and get $75.00 off your orders over $469.00! THIS SALE IS ONLY AVAILABLE TILL MONDAY! For example; Spend anything over $349.00 and use coupon code MP50 to receive $50 off your order OR Spend anything over $469.00 and use coupon code MP75 to receive $75 off your order. Promotion valid 01-31-19 12:00am est. to 02-04-19 at 11:59pm est. Use Coupon code: MP50 at Checkout for $50 off your order over $349.00! Use Coupon code: MP75 at Checkout for $75 off your order over $469.00! Coupon expires 02-04-19 at 11:59pm est. *Coupons can not be combined or used with any other special offers, discounting, gift certificates, or coupons. In order to be eligible for this offer you must spend a minimum of $349.00 for the $50 offer, or spend $469.00 for the $75 offer. MP50 coupon code valid until 02-04-19 at 11:59pm est. MP75 coupon code valid until 02-04-19 at 11:59pm est.